PET, clear, with natural HDPE screw cap. 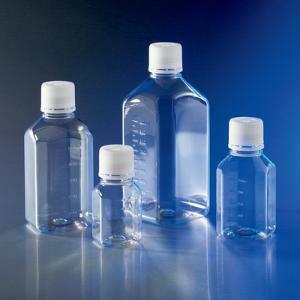 ideal for storage and sampling of media, biologicals, and other aqueous solutions. The PET resin makes the bottle lightweight, break resistant and as transparent as glass. Leakproof, tamper-evident HDPE screw cap. Molded graduations for accurate measurements.